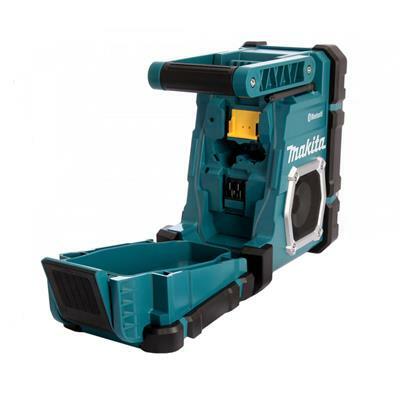 Makita DMR108C Cordless or Electric Bluetooth Jobsite Radio (Tool Only) delivers great sound in a compact size with more settings and mp3 compatibility, with one auxiliary port for mp3 compatibility and one USB port which allows for charging your mobile device, is a perfect addition to the workshop or job site. The DMR108 delivers rich stereo sound from two powerful 3.5-inch Side-Firing speakers. 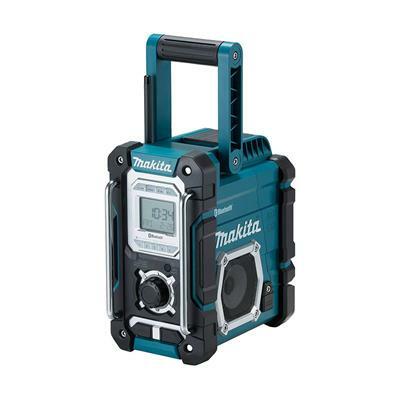 The radio can be powered by Makita 7.2V, 18V slide-style and pod-style batteries, including up to 20 hours of run time with the fast-charging 18V LXT lithium-ion 5.0ah Battery (sold separately). The DMR108 is engineered to stand up against harsh job site conditions, and features protective bumpers and water-resistant construction for increased durability.